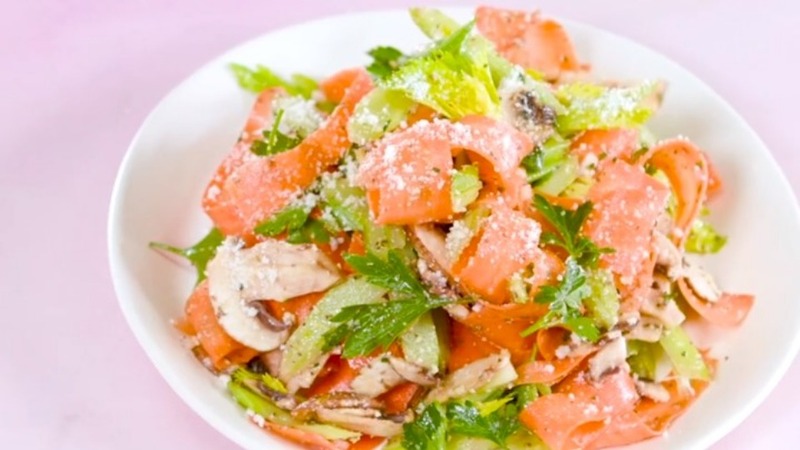 Celery Salad with Celery Seed Vinaigrette - GetCooking! Cooking Light’s – Celery Salad with Celery Seed Vinaigrette recipe. We love that this salad comes together with kitchen staples you’re likely to have on hand already. Celery, parsley, and Parmigiano-Reggiano cheese with lemony dressing is a classic Italian-style salad. We’d love to hear your feedback on this video recipe format in the comments section below! If you used this video to make Celery Salad with Celery Seed Vinaigrette, please tell us how it went! Launched in 1987, Cooking Light has thrived by showing the audience how to achieve balance in every aspect of their lives. They are dedicated in giving readers the necessary information to make smart choices about their food and their entire lifestyle, helping them feel better, look their very best and live life deliciously! View the original recipe notes here: Cooking Light’s – Celery Salad with Celery Seed Vinaigrette.